This retro-desert is making a big come-back in fine New York restaurants, and you found it first at the Birchwood Inn, Lenox! To make the meringue using a large bowl preferably with high sides, beat the egg whites with an electric mixer on high speed until they start to form soft peaks, then gradually whisk in the sugar about a quarter of a cup at a time and whisk between additions of sugar. 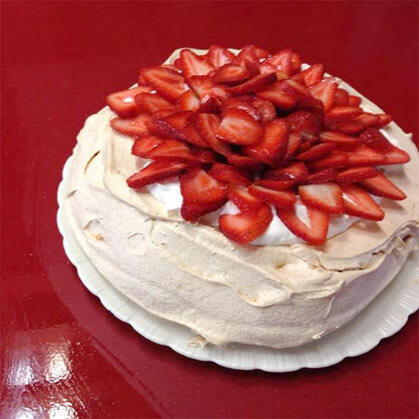 Your meringue should get a denser texture as you add the sugar, and continue to become stiffer. Adding the sugar too fast can break the meringue. Draw a circle on a piece of baking parchment using a dinner plate or 9 inch cake pan. Take about one third of the meringue and using a spatula spread it evenly using your circle as your guide. Now you want to make the sides of the meringue higher, so use remaining mixture and put blobs of meringue evenly spaced on the edge of your meringue circle, now using your spatula, join the blobs together and smooth off the edges and create a well in the middle. Bake on 275 degrees for about two and a half hours or until a strong crust has formed on the outside. Allow to cool, then peel off the parchment and place on your serving dish. Whip the heavy cream and vanilla (Chantilly Cream) and put it in the middle of your Pavlova, top with your favorite fresh fruit. Your guests will be wowed.